This paper deals with buoyant convection generated by a horizontal gradient of temperature in an infinite fluid layer, which is known as Hadley circulation, and studies the effects induced by applying a rotation around the vertical axis. First, the basic flow profile with rotation is derived and the influence of the rotation is depicted : The original longitudinal velocity profile is decreased in intensity when rotation is applied and its structure is progressively changed, whereas a transverse velocity component is created, which increases with the rotation intensity, overcomes the longitudinal velocity, and eventually decreases. Different asymptotic behaviors for these profiles have also been highlighted. The stability of these flows is then studied. 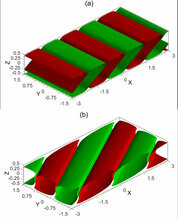 The effects of the Prandtl number, the Taylor number, and the thermal boundary conditions are highlighted for the three types of instability occurring in such a situation (shear, oscillatory, and Rayleigh instabilities). It is observed that they are all stabilized by the rotation and that the increase of the critical thresholds is accompanied by a spinning of the wave vector corresponding to a progressive change of the orientation of the marginal perturbation rolls. Energy budgets are finally used to analyze the instability mechanisms.